The "SoftRock" receiver kits have been around for a while. These are very inexpensive and basic quadrature sampler devices with a crystal controlled local oscillator. 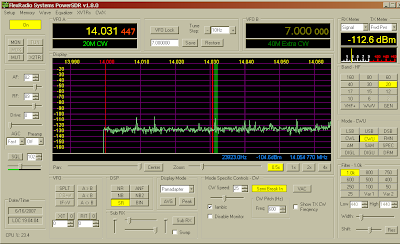 They make a complete receiver front-end for a Software Defined Radio. You can buy a version 6.2 SoftRock Lite kit from Tony, KB9YIG, for $10. I thought it was time to take the plunge. For your $10, you get to spend hours putting together the tiny (1.5" square) printed circuit board, with a number of surface-mount components. 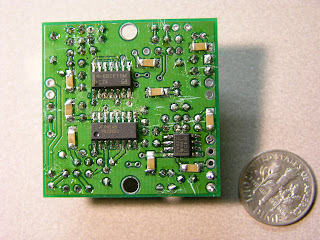 After a little fussing, I got to the point of feeling some confidence with hand soldering the tiny components. The hardest part is organizing the right array of magnifiers to be able to see what is happening. I packaged it into a small aluminum box, and that was that! To test it requires the following equipment: laptop computer, PowerSDR 1.8 software (from Flex Radio), a high-quality soundcard (I use the Edirol FA-66 Firewire box), and a good antenna (my 3-element SteppIR). With all that, we get the following view of the low end of 20 meters. Under normal band conditions, the SoftRock sounds just like my Orion transceiver. That is $10 well spent for self-education and fun. 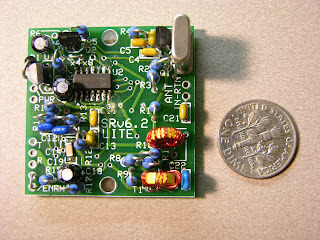 It calls out for a companion transmitter, so maybe the next step is to build a SoftRock Lite RxTx kit. Let's not get carried away - the RxTx kit costs $30.